Give your home a modern makeover with this stylish wall shelf. Gold wire metal frame with single display shelf and hooks. Perfect for placing in the bedroom, bathroom or hallway. This shelf unit will make a stylish addition to your home decor. Offering a practical solution in a modern, contemporary look. 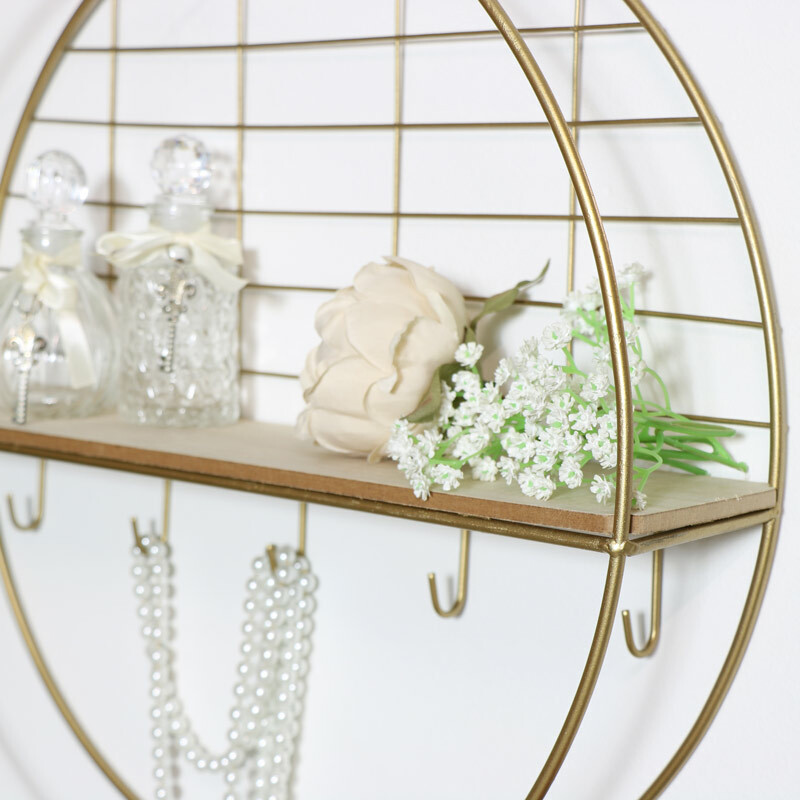 Gold painted wire metal framework with a natural wood shelf and 5 hooks below, ideal for holding keys or towels No matter where you choose to hang this shelf, it will make a wonderfully practical and stylish solution for your home. 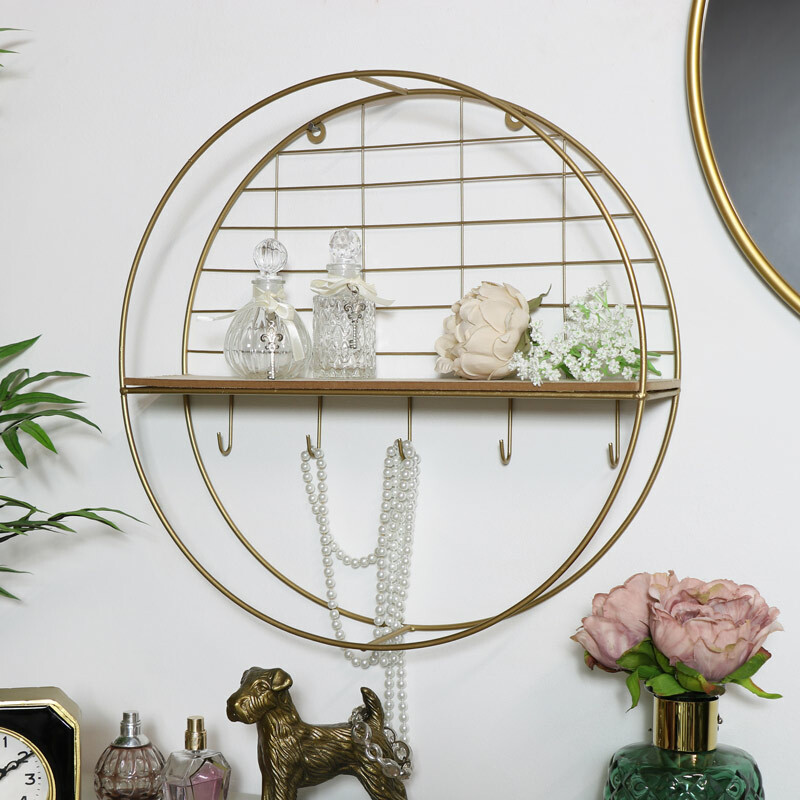 Give your home a modern makeover with this stylish wall shelf. Gold wire metal frame with single display shelf and hooks. Perfect for placing in the bedroom, bathroom or hallway. No matter where you choose to hang this shelf, it will make a wonderfully practical and stylish solution for your home. Constructed with a metallic gold painted metal wire style frame with single shelf and 5 metal hooks. Easily wall mounted with 2 holes for hanging. We have a fantastic selection of wall shelves and shelving unit for you to choose from. Take a browse through and see what we have to offer with something for everyone in a great choice of colours, styles and sizes.